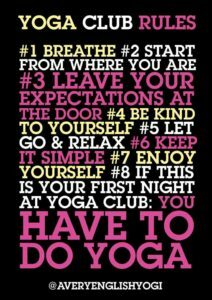 The 6th Yoga Club Rule is : ‘keep it simple’. It seems such a straightforward rule that I wonder why it’s even worth saying. But it is…. I think we tend to confuse complexity with meaningfulness. If something is complicated or complex – it means its uber brilliant or beneficial. It’s a bit like that thing where we confuse being busy (AKA busy-ness) with productivity. When we find ourselves going down that particular rabbit hole we need to back up and take in the surroundings, breathe and pause. And then think about simplifying. Keeping it simple means observing how we feel, and how we are. It also means considering what we want to achieve from our yoga practice. Keeping it simple means that we need to strip out all of the complexity and go back to some basic postures and moves. Starting with how we feel and what we wish to achieve in the practice is the priority. That’s why it’s always useful to have 5 -10 minutes of quiet time just observing your breathing and noting how your body, breath and mind are. Of course, simply laying down in the savasana (corpse) pose and observing your body, breath and mind will automatically begin to slow it all down. But, in the first few minutes you can see how your energy levels are and whether you wish to move to a different energy level through the practice. Mostly we seek to have balance and equilibrium in our body, breath and mind – so if we are highly charged or very sluggish it is a question of looking towards a practice that slows us down or sharpens us up. It’s an incredibly personal thing. Yoga in classes with a set programme of postures are ok as far as it goes but they should be taken as a guide for your personal practice – learn the poses but then select what you need at any given time based on how you feel, and how your body and mind are. So let’s keep this simple. Lay down in that corpse pose, and simply observe yourself – your breathing, body and mind. Use this observation to guide you. You may for example simply wish to lay there observing your breath. Or after a while you may wish to open and stretch the body. You may feel that you could benefit from flexing and lengthening the spine, or that that shoulders could do with a bit of gentle mobilisation. You get the picture – it’s a personal practice and requires a personal response to what we observe or feel. It could be that you are at ease in your body but your mind is all over the place and you wish to still it. So you may wish to stay with breath observation, or perhaps listen to a sound, or make one (this is called mantra or chanting) or maybe you find that staring at an object is helpful in stilling the mind. Some people like to do this using a lit candle for example. The important thing is to start where you are and not attempt to do some twisty, bendy stuff that you saw on Instagram or in a magazine. In that direction lies the circus and fairground attractions. Leave the twisty bendy stuff for now. Its complicated and complex and you may miss the point of yoga. Focus on some simple postures, moves or activities and keep them uber simple. This is where yoga teachers can really help. Go to a yoga class and learn some simple basic yoga postures, and breathing techniques. Bring them back home, and build them into a simple personal practice that supports you. It’s worth finding a teacher who has a personal practice and who can perhaps make helpful suggestions to you about your personal practice. Some will spend time with you to construct a personal practice in a 1:1. This can be incredibly helpful. You can find teachers all over the place – lots of organisations also provide a degree of reassurance that they are ok – for example The British Wheel of Yoga, the Iyengar or Ashtanga teachers, or the Independent Yoga Network. Finding a yoga teacher and class can be a bit of “hunt and peck” type activity – it may well be worth trying a few teachers before you settle on one. But don’t be suckered into doing yoga practices (postures, breathing, meditation etc) that feels like they are more than you want or need. Be guided by you and where you are at this moment in time, and most of all – keep it simple.